[162 Pages Report] The Global Low Temperature Coating (low cure coating) Market was valued at USD 3.50 Billion in 2015 and is projected to reach USD 5.13 Billion by 2021, at a CAGR of 6.7% between 2016 and 2021. The base year considered for the study is 2015, while the forecast period is between 2016 and 2021. 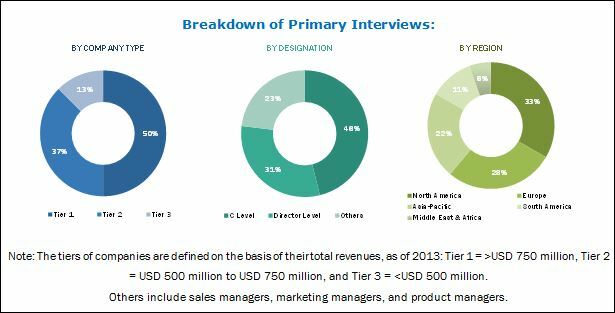 Both, top-down and bottom-up approaches have been used to estimate and validate the size of the global low temperature coating (low cure coating) market, and to determine the sizes of various other dependent submarkets. The research study involved extensive use of secondary sources, directories, and databases, such as Hoovers, Bloomberg, Chemical Weekly, Factiva, and other government and private websites to identify and collect information useful for the technical, market-oriented, and commercial study of the global low temperature coating (low cure coating) market. The value chain of the global low temperature coating (low cure coating) market includes sourcing of basic raw materials, manufacturing and supplying of raw materials to low temperature coating (low cure coating) manufacturers, and usage of low temperature coating (low cure coating) in various end-use industries. The raw materials for low temperature coating (low cure coating) are binders, solvents, additives, and coating fillers. Suppliers of these raw materials include KISCO Limited (Japan), The Dow Chemical Company (U.S.), Cytec Solvay Group (U.S.), and BASF SE (Germany). The raw materials are used by various low temperature coating (low cure coating) manufacturers, which include PPG Industries Inc. (U.S.), The Valspar Corporation (U.S.), Axalta Coating Systems (U.S.), Bowers Industrial (U.S.), Platinum Phase SDN BHD (Malaysia), and VITRACOAT America Inc. (U.S.). This research report categorizes the global low temperature coating (low cure coating) market on the basis of coating type, resin type, end-use industry, and region. The global low temperature coating (low cure coating) market is projected to reach USD 5.13 Billion by 2021, at a CAGR of 6.7% from 2016 to 2021. Low temperature coating (low cure coating) has been specifically formulated to develop a fully cured coating which can be set at lower oven temperatures or with shorter dwell times at conventional oven temperatures. These coatings are well suited for heat sensitive substrates and assemblies. Low temperature coating (low cure coating) is used in automotive, industrial, heavy-duty equipment, furniture, and architectural end-use industries. These end-use industries drive the low temperature coating (low cure coating) market, globally. In 2015, the automotive segment accounted for the largest share of the global low temperature coating (low cure coating) market and is expected to continue to lead during the forecast period. Low temperature coating (low cure coating) are used in the automotive industry for the protection of automobile parts from corrosion, wear & tear, and retention of color coatings. Based on coating type, the powder-based segment is projected to grow at the highest CAGR between 2016 and 2021. Powder-based low temperature coating (low cure coating) exhibits superior properties over conventional paints, including high resistance to corrosion, high-quality finish, chipping and abrasion resistance, durability, and cost-effectiveness. Increasing demand for powder-based low temperature coating (low cure coating) from various end-use industries such as automotive, furniture, and heavy-duty equipment are expected drive the growth of this segment during the forecast period. Growth in the heavy-duty equipment and manufacturing industries has led to an increase in the demand for low temperature coating (low cure coating). In 2015, the Asia-Pacific region accounted for the largest share of the global low temperature coating (low cure coating) market. China is expected to account for the largest share of the Asia-Pacific low temperature coating (low cure coating) market till 2021, whereas, this market in India is anticipated to grow at the third highest CAGR after China and Taiwan during the forecast period. Low temperature coating (low cure coating) might not be suitable for thin film applications. It is difficult to produce thin finishes using these coatings because of the thickening of the polymer which can lead to the formation of an uneven texture. This can act as a restraint to the growth of the market. 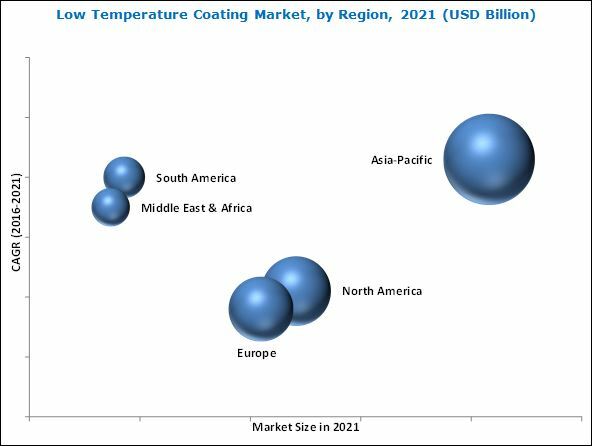 Companies have adopted strategies such as new product developments, expansions, and mergers & acquisitions to enhance their market shares and widen their distribution networks in the global low temperature coating (low cure coating) market. These companies engage in research & development activities to innovate and develop products that can open new avenues of applications. For instance, PPG Industries Inc. launched Coraflon powder coatings at Austin Convention Center, Texas, U.S. Coraflon coatings require lower cure temperatures in comparison to liquid fluorocarbon coatings, resulting in energy savings. Similarly, The Valspar Corporation launched the ValdeTM Extreme Flex Cure (EFC) powder coating technology that delivers exceptional performance at a much lower temperature and faster cure rate in comparison to conventional powder coatings. The Valspar Corporation has well-recognized brands of low temperature coating (low cure coating) and has a strong operational network in the U.S., which, in turn, helps the company expand its regional presence. 12.7 Specialty Polymer Coatings Inc.